Find out how to plan Frankfurt trip without stress by asking Inspirock to help create an itinerary. Sao Paulo, Brazil to Frankfurt is an approximately 15.5-hour flight. You can also do a combination of bus and flight. Due to the time zone difference, you'll lose 4 hours traveling from Sao Paulo to Frankfurt. 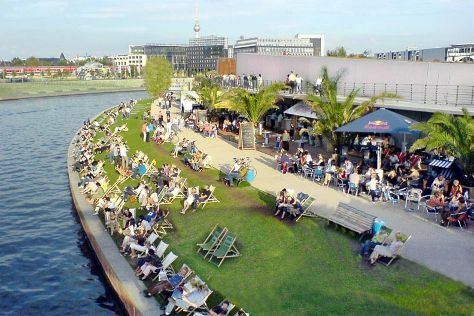 In June in Frankfurt, expect temperatures between 28°C during the day and 15°C at night. Finish up your sightseeing early on the 28th (Fri) so you can travel to Berlin. Get a sense of the local culture at Pergamonmuseum and Topography of Terror. Your itinerary includes some good beach time at Strandbar Mitte and Strandbad Wannsee. There's still lots to do: wander the streets of Potsdamer Platz, get engrossed in the history at Jewish Museum Berlin, contemplate the long history of East Side Gallery, and appreciate the history behind Brandenburg Gate. For reviews, photos, other places to visit, and more tourist information, use the Berlin trip planner. You can fly from Frankfurt to Berlin in 3 hours. Alternatively, you can take a train; or drive. Finish your sightseeing early on the 3rd (Wed) to allow enough time to travel to Amsterdam. You'll enjoy a bit of beach vacationing at Zandvoort aan Zee and Scheveningen beach. Museum-lovers will appreciate Rijksmuseum and Van Gogh Museum. Explore Amsterdam's surroundings by going to Frans Hals Museum (in Haarlem) and The Mauritshuis Royal Picture Gallery (in The Hague). There's lots more to do: examine the collection at Anne Frank House, take a stroll through Leidseplein, explore the world behind art at Museum Het Rembrandthuis (Rembrandt House), and tour the pleasant surroundings at Vondelpark. To find traveler tips, other places to visit, where to stay, and other tourist information, read our Amsterdam road trip website . Fly from Berlin to Amsterdam in 4.5 hours. Alternatively, you can do a combination of flight and train; or drive. July in Amsterdam sees daily highs of 26°C and lows of 16°C at night. Finish your sightseeing early on the 7th (Sun) to allow enough time to travel to Rome. Vatican Museums and Musei Capitolini will appeal to museum buffs. Your itinerary includes some good beach time at Stabilimento Balneare le Palme and Nuova Pineta Pinetina. Explore the numerous day-trip ideas around Rome: Lido Beluga (in Sperlonga), Le Ninfe (in Castel Gandolfo) and Lido Il Grillo (in Fondi). The adventure continues: steep yourself in history at Colosseum, enjoy the sand and surf at V Lounge Beach Club, admire the masterpieces at Galleria Borghese, and admire the local landmark of Trevi Fountain. Discover how to plan a Rome trip in just a few steps with Inspirock's itinerary builder. Traveling by flight from Amsterdam to Rome takes 5.5 hours. Alternatively, you can do a combination of flight and train; or drive. In July, Rome is a bit warmer than Amsterdam - with highs of 37°C and lows of 24°C. Wrap up your sightseeing on the 16th (Tue) early enough to travel to Barcelona. Do some cultural sightseeing at El Barri Gòtic and Casa Batllo. Museo Picasso and Parc de Montjuic will appeal to museum buffs. You'll find plenty of places to visit near Barcelona: Lloret de Mar (Cala Banys & Sa Caleta), Tamariu (La playa de Tamariu & Aigua Xelida) and Begur (L'illa Roja, Playa Sa Riera, & more). And it doesn't end there: admire the striking features of Basilica of the Sagrada Familia, kick back and relax at Platja Port Bo, don't miss a visit to Las Ramblas, and stroll through Barceloneta Beach. For where to stay, ratings, other places to visit, and other tourist information, refer to the Barcelona trip planner. You can fly from Rome to Barcelona in 5.5 hours. Alternatively, you can drive; or take a train. Traveling from Rome in July, you will find days in Barcelona are little chillier (34°C), and nights are about the same (25°C). Finish your sightseeing early on the 21st (Sun) so you can travel back home.